This is an entry from “We of Johann Christoph Nuffer, also known as: Neuffer, Nufer, Neufer,” The book was published in April 1990 by Dabco Printing and Binding Co in Roy, Utah. The book does not give a source, but reads as an obituary, but I cannot tell which newspaper or publication. Some of the mistakes in it seem to show it was not written by a family member. May actually be more of a quick biography than an obituary. Some day I may know the source. I have kept the capitalization and spellings as in the article. You can find the biography of Johann as written by his granddaughter Alma Katherine Scheibel Naef. “JOHANN CHRISTOPH NUFFER, Pioneer was born at the City of NEUFFEN State of Wurtemberg, Germany on the 6th of March 1835. His parents were JOHAN JACOB NUFFER and MARIE MAGDALENA KIRNER NUFFER: his grandfather JOHAN CHRISTOPHER NUFFER, his wife CHRISTINA KATHARINA PFEIFFER died and he married his second wife MARIE KATHARINA KLEIN. His great grandparents wher JOHAN JACOB NUFFER and ANNA MARIE SCHWINDLIN. She and their ancestors were living in the City of Neuffen, a small city at the foot of the Schwabisen Alb in Southern Germany. 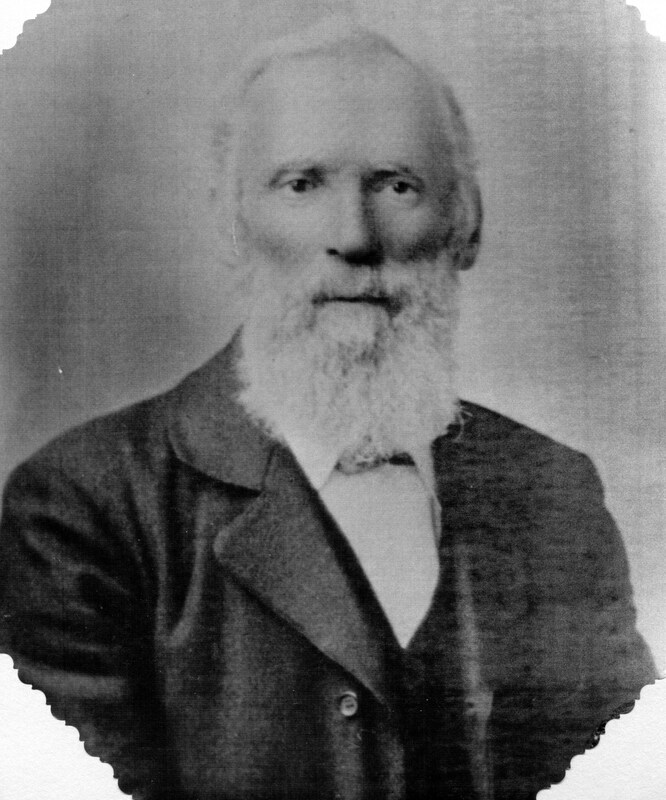 JOHAN CHRISTOPH NUFFER, the Pioneer was married to Agnes BARBARA SPRING, who died Feb. 29, 1867. He had two sons with her, JOHN NUFFER born Dec. 4, 1862 and FRED NUFFER born Jan. 20, 1864. He married EVA KATHARINA GREINER who with him and the family consisting of JOHN and FRED NUFFER of his first wife and REGINA, KARL AUGUST & ADOLF, his second wife, emigrated to the United States in May 1880 and came to Logan, Utah in June 1880. In the year 1879 he with his wife had joined the Church of Jesus Christ of Latter day Saints. “In the Fall of 1880 he moved with his family to Providence in 1883 they again moved to Worm Creek, then belonging to the Franklin Ward, later the Preston Ward. His son John homesteaded 160 Acres at that place at the divide between Worm Creek & Cub River. They lived at that place until the Spring of 1884, when he homesteaded 160 acres on the Cub River side of the divide, now belonging to the Mapleton Ward. Feb. 26, 1893 his wife EVA KATHARINA died; with her he had the following children, REGINA, KARL AUGUST, ADOLF, and MARIE who died Oct. 5, 1900, at the age of 9 years. In the year 1895 he again married, to ANNA ELIZABETH REBER, she died Dec. 1, 1901. In 1903 he again married MARIE ALKER, SCHAUB. He died Apr. 12, 1908.